Photo credit: Patrick Buechner / Flickr (CC BY-NC 2.0) and US Courts. District Court Judge Amy Totenberg ruled late Monday night that the midterm elections in Georgia will proceed as planned — denying a proposal by plaintiffs in a lawsuit against the state that would have required the election to be carried out with paper ballots instead of touchscreen voting machines. Although sympathetic to concerns about systemic vulnerability, she concluded that remedial measures would constitute an unreasonable burden on the government. The decision comes after nine hours of testimony and cross-examination last week in Atlanta’s federal court. Several computer experts with decades of experience between them testified that Georgia’s current voting system is susceptible to outside hackers serving foreign interests. Witnesses and attorneys for the state responded to such claims by expressing confidence in security measures such as physically tying up the voting machines, and digital security added since researchers, several times in the last two years, exposed the system’s flaws. They also said it would be costly and difficult to change plans in time for early voting, which begins October 15, and for Election Day, November 6. Obstacles, according to state officials, include a lack of enough digital scanners required to count the ballots, no plans for storing the ballots, as well as the possibility that the switch would force voters to wait longer in line to vote. The decision perpetuated a pattern that has persisted throughout most of Georgia’s 16-year history with touchscreen machines that lack a paper ballot trail: voters’ rights groups and other organizations sue the state over the lack of security and reliability in a dispute involving such systems, citing a growing number of experts on the matter — and yet the state’s defense prevails. Georgia is one of only five states where all voting takes place using such machines. Plaintiffs were outspoken in their disappointment over seeing this pattern continue and charged officials with ignoring credible warnings. “Secretary of State Kemp, the State Election Board, and the bipartisan Fulton County Election Board refused to act in response to serious and repeated warnings from Congress, federal agencies, National Academy of Science and scores of expert voting system computer scientists that the paperless system is unfit for conducting public elections,” said Marilyn Marks, executive director of the Coalition for Good Governance, a North Carolina–based nonprofit organization — and one of the plaintiffs — in a written statement. Despite her refusal to compel the authorities to go with paper, Judge Totenberg, in her conclusion to the decision — literally released at the 11th hour Monday night — sternly chastised the state, and generally admonished it to do better to remedy systemic problems with voting. The plaintiffs said they will continue pressing their case for a verifiable paper trail in Georgia’s elections, and announced plans to pursue a similar proposal if no candidate for governor receives more than 50 percent of the vote, and runoff elections are scheduled for December, as would be required by Georgia law. They also sought to portray the jurist’s remarks as generally supportive of their concerns. 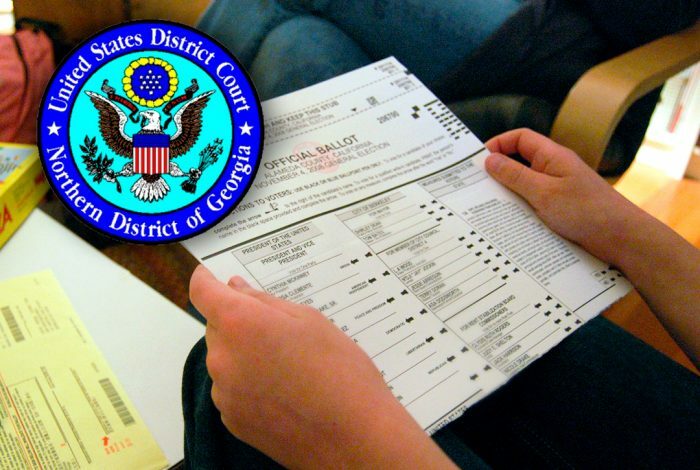 “Judge Totenberg’s decision is broadly consistent with the positions that the Coalition is taking in the case — particularly the urgent need for Georgia, as soon as feasible, to switch to paper ballots,” said Bruce P. Brown, Atlanta attorney for the Coalition. The case, and this decision, will likely be frequently cited in the coming months and years, as more jurisdictions confront a lack of confidence in unverifiable and vulnerable voting systems. Related front page panorama photo credit: Adapted by WhoWhatWhy from court (US Courts).